We are highly qualified independent surveyors who can provide help and advice with regards to problems with your property. We can carry out a Specific Defects Report (often known as an Engineers Reports), Building Surveys (also known as Structural Surveys) and Independent Valuations but please note these are not for bank lending but are to advise you how much we feel the property is really worth. Our surveys are easy to understand, listing out the property problems and how to resolve them, plus an estimate of costs for work. Please Free phone us on 0800 298 5424 for a friendly chat with a surveyor. Clay has several unique properties. It can both cause problems when it is a clay soil that your house is built upon and be useful when it is used for the bricks that your house is made of. Clay expands and contracts, depending upon its moisture content. It is at its bulkiest at 40% to 60%, however, it changes form if it gets wetter or dryer. It is this change of its bulk that causes problems. When the clay soil gets too wet the clays bulk becomes larger and almost pushes the property out of the ground. This is known as heave. When the clay dries out it becomes dust like, then we get settlement of foundations and subsidence of the building, as its bulkiness has reduced considerably. Its ability to change size wouldn't be such a problem if it weren't that most London properties are built on clay, and there are many areas of clay throughout the country, such as Bedfordshire and Peterborough , which, interestingly enough, are also known for brick making. There are several ways of finding out if your property is built on clay soil. If the property has historic cracks it may be that it is built upon clay. It is best to check before you panic. You can do this by looking at geological maps or ringing up your friendly insurance broker, as they have a postcode index as to what areas are considered high risk with clay and which aren't. However, we must add that these maps are quite general and that when we were on a course many years ago we asked how these maps were originally made. We were advised that students were employed during their summer holidays, so the reliability of them, it could be argued, is limited for the purposes of identifying if clay is under your building, as they were originally produced to help farmers. This is what a good surveyor would do if they had come to investigate problems with your foundations and the owner of the property was happy for them to dig up the garden! We take a lump of soil from the garden; this should be approximately the depth of the foundations. If it is a Victorian or Edwardian property it may be a lot less, in a modern property it is likely to be 1 metre to 1.2 metres, to even 1.4 metres deep. On a summer's day you can leave the lump of soil in the garden for it to dry out in the sun. When it dries out if it becomes powdery and much lower in volume then it is clay. Equally, if it rains and it becomes a larger volume then it is clay. Also, if it is not warm you can leave it inside on the radiator. We believe (although we would need to check it) that a growth or reduction of approximately 30% (for some reason 28% is ringing bells). This type of clay is known as shrinkable clay. We would add that not all clay expands and contracts. 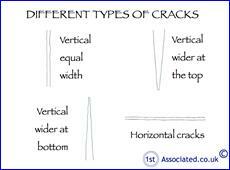 The deeper clay tends to be the more stable and harder clay and therefore doesn't expand to the same extent. We thought we would just add something about clay that is made for the use of brick making. The older bricks, were possibly even sun baked rather than fired, used a softer red clay. They have their own oil so they can affectively cook themselves. You will also notice that it is the softer red clay bricks, even up the post-war era, that tend to be affected first by spalling. Blue clay is fairly well known. This type of clay tends to be the harder clay and produces harder bricks and you may find bricks made out of this clay. A classic brick, and generally considered the hardest brick, is the Accrington brick and you would have to dig deep for this clay, i.e. normal clay would be dug at about 30 feet, or the metric equivalent! A yellow or white clay, that is used in a London stock brick, is harder than the soft red bricks but not as hard as the blue clay bricks. The one thing that used to confuse us for many years is what is the difference between a Fletton brick, a stock brick and a common brick. A Fletton brick, we believe, has its origins in Fletton near Peterborough , where bricks are produced in such quantities that it became the common name. Stock bricks tend also to be a common brick, but it specifically relates to bricks that don't have their own oils to fire, they would typically have to have methane today and years gone by coal dust to fire them, where as the soft red bricks tend to have their own oil that they can fire in. Therefore, you tend to find many of the older properties have a red brick as they were fired in the sun. The term common brick is a generic name. This isn't a brick at all, but, we believe, is made from concrete. We have a wealth of knowledge about all things property related (not just bricks!) and always recommend that you have an independent building survey as this will pin point any property problems. Caveat emptor means buyer beware and is why you need to have a building survey to find out if there are any problems within the property; the estate agent certainly will not advise you of any problems but we most definitely will! We include sketches and photos in our building surveys to identify problem areas and to help to explain pictorially the problems we have found. We also use ovals and circles in our photos and sketches to highlight certain areas to you like the one below of a crack between the original building and the extension.